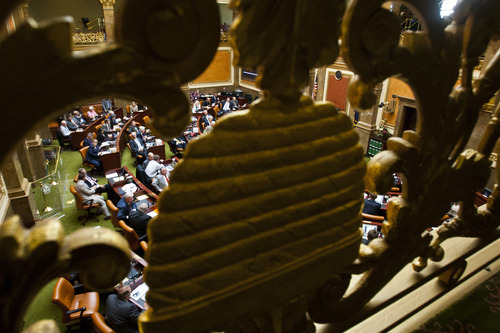 Utah House • Republicans hold 5-4 edge on panel as lawmakers OK rule changes for the inquiry. Rick Egan | The Salt Lake Tribune Jim Dabakis discusses a bill in the Senate, during the special Legislative Session, Wednesday, July 17, 2013. Al Hartmann | The Salt Lake Tribune Rep. Rebecca Chavez-Houck D-Salt Lake City speaks against passing 2HB391, Prohibition of Medicaid Expansion in the Utah House of Representatives Monday March 11. Rick Egan | The Salt Lake Tribune Todd Weiler discusses a bill n the Senate, during the special Legislative Session, Wednesday, July 17, 2013. Al Hartmann | The Salt Lake Tribune Rep. Rebecca Chavez-Houck D-Salt Lake City speaks against passing 2HB391, Prohibition of Medicaid Expansion in the Utah House of Representatives Monday March 11. Chris Detrick | The Salt Lake Tribune House Majority Leader Brad Dee, R-Ogden, talks during a special session in the House of Representatives at the Utah State Capitol Wednesday July 17, 2013. 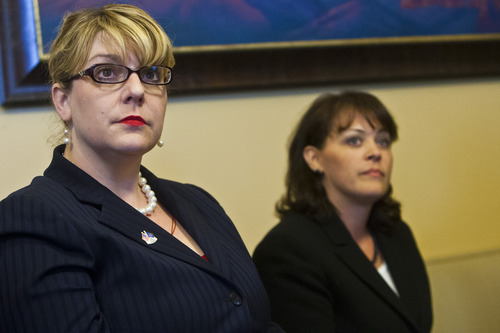 Chris Detrick | The Salt Lake Tribune Rep. Jennifer Seelig, D-Salt Lake City, and House Speaker Becky Lockhart, R-Provo, speak during a press conference after a special session in the House of Representatives at the Utah State Capitol Wednesday July 17, 2013. 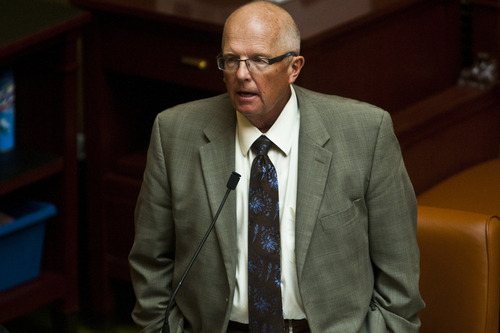 Chris Detrick | The Salt Lake Tribune Rep. Mike Noel, R-Kanab, speaks during a special session in the House of Representatives at the Utah State Capitol Wednesday July 17, 2013. Chris Detrick | The Salt Lake Tribune Rep. Mike Noel, R-Kanab, listens during a press conference after a special session in the House of Representatives at the Utah State Capitol Wednesday July 17, 2013. Chris Detrick | The Salt Lake Tribune Rep. Mike Noel, R-Kanab, speaks during a special session in the House of Representatives at the Utah State Capitol Wednesday July 17, 2013. 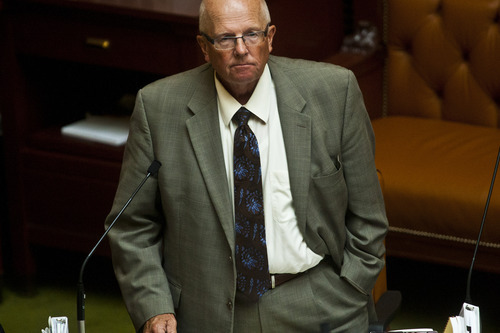 Scott Sommerdorf | The Salt Lake Tribune Rep. Jim Dunnigan, R-Taylorsville, in the Utah House of Representatives, Thursday, February 28, 2013. 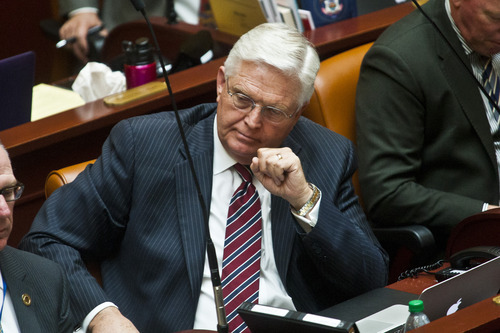 Chris Detrick | The Salt Lake Tribune Rep. V. Lowry Snow, R. St. George, listens during a special session in the House of Representatives at the Utah State Capitol Wednesday July 17, 2013. Chris Detrick | The Salt Lake Tribune Members of the public and media listen during a special session in the House of Representatives at the Utah State Capitol Wednesday July 17, 2013. 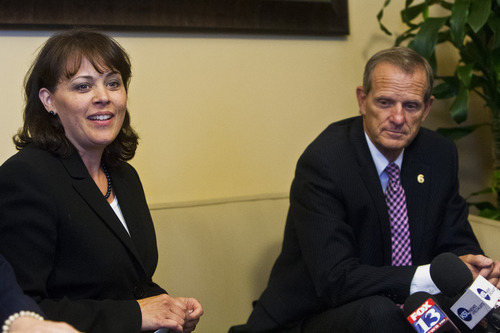 Chris Detrick | The Salt Lake Tribune House Speaker Becky Lockhart, R-Provo, and House Majority Leader Brad Dee, R-Ogden, speak during a press conference after a special session in the House of Representatives at the Utah State Capitol Wednesday July 17, 2013. Chris Detrick | The Salt Lake Tribune Majority Whip Gregory H. Hughes, R-Draper, speaks during a press conference after a special session in the House of Representatives at the Utah State Capitol Wednesday July 17, 2013. Rick Egan | The Salt Lake Tribune Patricia W. Jones discusses a bill, in the Senate, during the special Legislative Session, Wednesday, July 17, 2013. 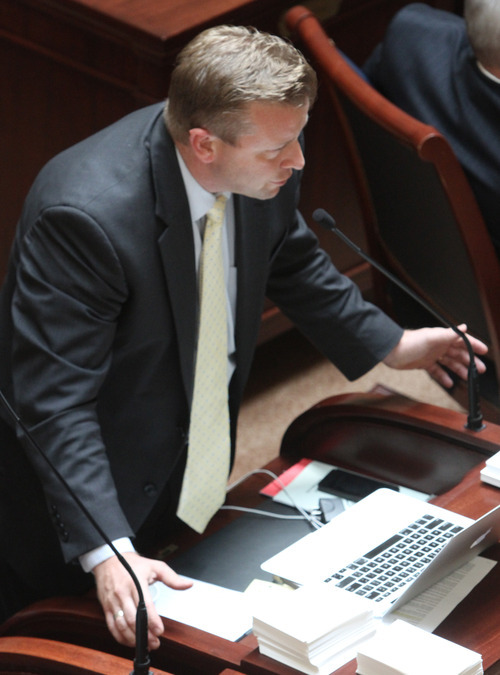 The House committee investigating Attorney General John Swallow will include a former Utah State Bar president, a cop and House leaders from both parties. House Speaker Becky Lockhart, R-Provo, appointed the nine-member panel Wednesday, launching the unprecedented investigation that ultimately could pave the way for impeachment of the state&apos;s top cop. 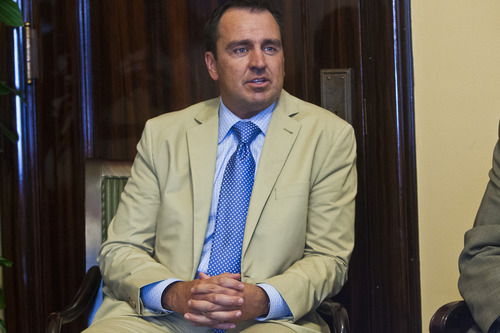 Rep. V. Lowry Snow, a Republican from St. George in just his second year in the GOP-dominated House, will head the committee. 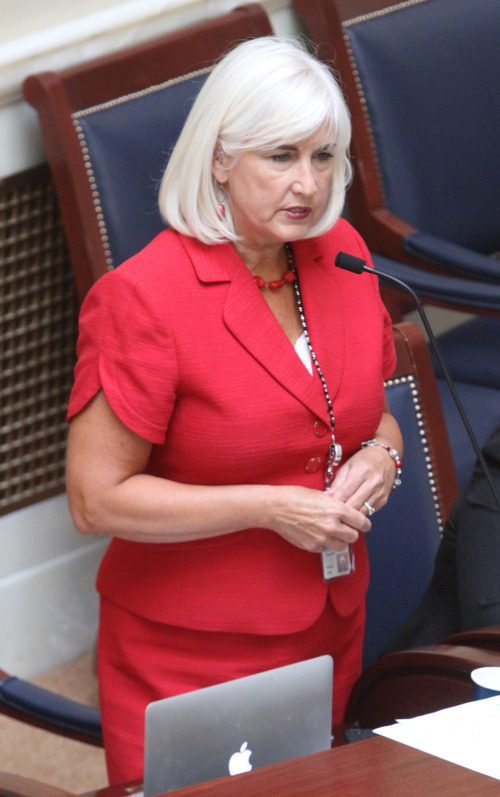 Snow, an attorney and former president of the Utah State Bar, will exercise considerable authority over the issuance of subpoenas and the granting of immunity to potential witnesses. "Representative Snow is a very competent and respected member of the body, albeit fairly new," Lockhart said. "I think you&apos;d find universal admiration of his skill and demeanor. … I have great confidence in his ability." The committee will have five Republicans and four Democrats, although Lockhart said she doesn&apos;t anticipate partisan loyalties will be a major factor in the inquiry. In addition to Snow, Republican Reps. Jim Dunnigan of Taylorsville, Mike McKell of Spanish Fork, Lee Perry of Perry, and House Majority Leader Brad Dee of Ogden will be on the panel. McKell is an attorney; Perry is a Utah Highway Patrol trooper. 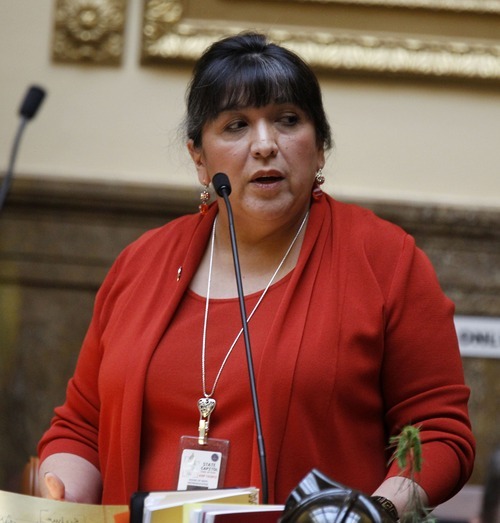 The Democrats on the panel will be House Minority Leader Jennifer Seelig and Rebecca Chavez-Houck, both of Salt Lake City, along with Susan Duckworth of Magna and Lynn Hemingway of Holladay. Snow said he suspected he might be tapped for the committee but "was taken aback" when Lockhart asked him to lead it. "I appreciate her confidence," he said in an interview Wednesday night. Snow hopes to have the committee&apos;s first meeting within 10 days. He said it is too soon to tell how frequently the panel will meet or how long the investigation will take. "I really am committed to making certain that it is a fact-finding and that we don&apos;t begin the process with any predetermined result," Snow said. "At the end of the day, I see our work as the submission of our report … and if, at that point, the position of the body is that those findings exonerate [Swallow], then I&apos;m entirely fine with that." Democrats had sought an eight-member panel with four from each party so there would not be a public perception that partisan politics might play a role in the outcome. Seelig said she believes the 5-4 split can still accomplish that. "We are moving in the same direction related to the restoration of the public trust," she said. Swallow, who is a Republican, is under investigation by federal, state and county officers. He faces a range of allegations, including accusations that he helped broker a bribe to a U.S. senator and received improper gifts. In addition to unveiling the members of the committee, the Legislature met in special session Wednesday, passing a series of bills, giving subpoena authority and other powers to the special House committee. The measures also empower the panel to meet behind closed doors to get legal advice, hold strategy meetings and to interview witnesses if public testimony might impede a criminal probe. Dee said the changes to the law were necessary to ensure the House could investigate the claims effectively and stressed that when "a man&apos;s character, his livelihood and his life" are at stake, it is imperative lawmakers have all the information possible. The House committee is expected to spend several months and potentially as much as $3 million investigating a string of alleged misconduct involving Swallow. 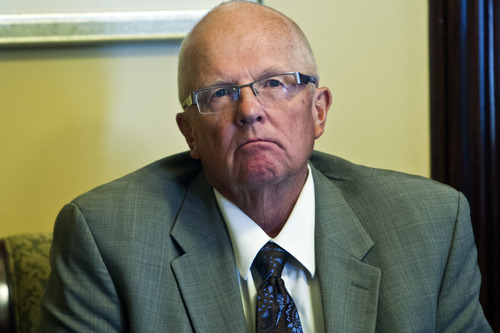 Rep. Ken Ivory, R-West Jordan, has steadfastly resisted launching a House investigation without clear limits on its scope and a defined standard for removing Swallow from office. He said the House is subjecting the attorney general to "the full weight of the government investigating something when we haven&apos;t defined its scope." "No one is arguing for doing nothing," Ivory said, "but to define the standard and do it right, where accuracy is more important than speed, I think is prudent." The House met July 3 to create the investigative panel, but a special session was necessary to ensure that the probe had the power to issue subpoenas and have witnesses testify under oath. The House passed the changes with just a few dissenting votes. There was almost no debate or dissent in the Senate, either. Both bills go to the governor for his signature. The House is already seeking to hire legal counsel to assist in the investigation and is also expected to tap an investigative firm. 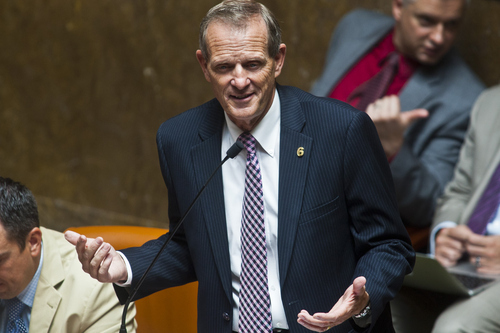 Two bills passed Wednesday would grant a license for out-of-state lawyers and investigators to work in Utah. Swallow&apos;s lawyers, in a letter to lawmakers this week, protested the formation of the committee, arguing the Legislature is overstepping its constitutional bounds by not limiting its investigation to events since Swallow took office in January. They suggested that the House abandon the probe. They also requested the ability to subpoena their own witnesses and to participate in witness interviews. The head of the House wasn&apos;t swayed. "I absolutely unequivocally disagree" that the committee is exceeding its constitutional authority, said Lockhart, who also rejected the idea that Swallow should be able to subpoena witnesses or take part in interviews. She compared the House probe to a congressional investigation in which targets are not given the same latitude. "This is a legislative investigation," she said, "and we will conduct it as such." 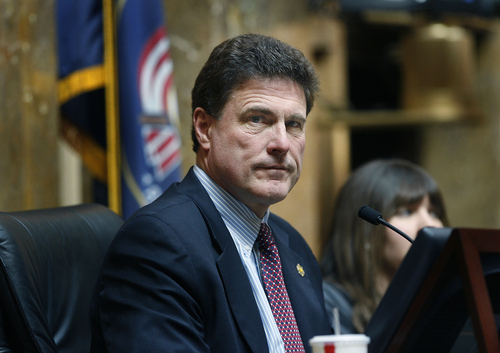 The Utah Democratic Party said by giving Republicans a 5-4 edge on the committee, Lockhart had disregarded the precedent set by the evenly split legislative ethics panel, created to ensure its probes are not controlled by one party. "[Republicans] had a choice between honesty and control, between fairness and brute power, and between restoring lost faith and partisan tactics," said state Democratic Chairman Jim Dabakis, who also is a state senator. 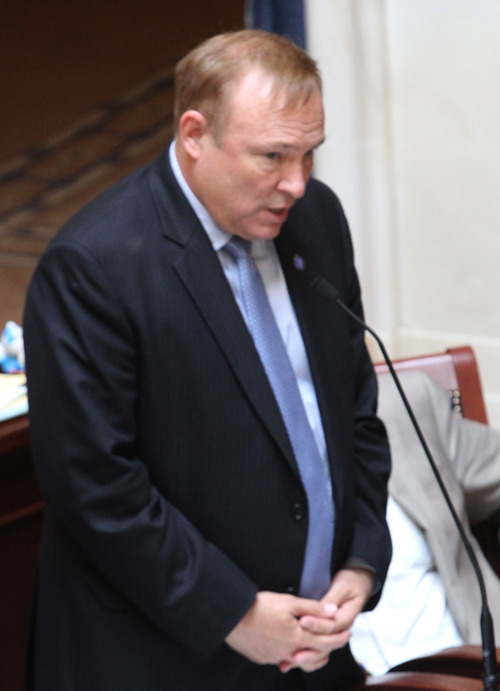 "Unfortunately for the people of Utah, Utah GOP House leadership chose control, power and partisanship." Swallow, who denies wrongdoing, has pledged to cooperate with the House committee, though he has expressed fears that the inquiry "could get crazy." House leaders have said they desire to keep the panel&apos;s work as open to the public as possible. The Alliance for a Better Utah, for one, is hoping for the same. "At the end of the day, John Swallow is a public figure, and his actions while working for the state should be scrutinized in public view," the left-leaning group said in a statement before Wednesday&apos;s special session. "In the event that changes to open-records laws are deemed to be necessary, we encourage caution. ... Above all, the Legislature should avoid any amendments that could inadvertently narrow current open-records law, thereby further exacerbating the public&apos;s loss of trust in government and government officials." The Utah Legislature agreed to pay $3 million to the owners of the Deep Creek Ranch to resolve a 16-year-old dispute over the State Armory Board&apos;s purchase of 800 acres in Tooele County. The Armory sought to exchange credits for surplus state and federal property for the land, but the federal government said it could not legally enter into such an agreement. The error resulted in 14 years of litigation as Deep Creek sought to resolve the issue. The $3 million reflects some attorney fees, interest and a multiplier that includes any profit Deep Creek could have received for selling the surplus property. The money will come from the state&apos;s rainy-day funds.